In Master and Commander, the Captain and the Doctor meet for the first time at afternoon concert in Port Mahon on Minorca. This introduces the theme of music in the series. The next day they meet again by chance in the street, and during the course of that extended conversation, the Doctor sees a hoopoe (Upupa epops aver. length 10-12 in.). This introduces the theme of natural history into the stories. Here it is, as the Doctor described it: "A beautiful little cinnamon colored bird with barred wings." It is interesting that the Doctor had not seen it before, as its range extended as far as England during the 18th century. 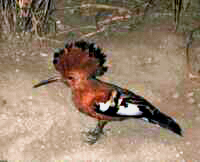 At present there are two breeding groups of hoopoes, one around the Mediterranean and into Asia, and another in Africa south of the Sahara desert. 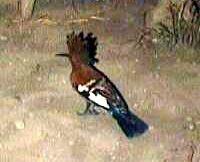 In both places the hoopoes eat insects and other invertebrates. They mate for life, and travel in pairs making their nests quite close to the ground in hollow trees, or other ready made enclosures. They are also one of the few birds that does not keep their nest clear of excrement, possibly as a deterrent to predators. The specimen on exhibit has its crest erect, either for threat or display, but it would be lowered while flying. On the other hand, the barred feathers (alternate black and white) on the wing would be clearly visible with the wings outstretched in flight. Once the Doctor joined the Captain, he had many opportunities to see even more amazing birds.